Tak-Thok Tse-Chu is an important festival which is held in the month of July and August and draws a large number of tourists and the local people. It is generally celebrated on the 10th day of the Lunar Tibetan Calendar. The Tsechu Festivals are celebrated by chham dances where both the monks and the local people dance. The dances depict different aspects of the wrathful and compassionate deities and a variety of animals. 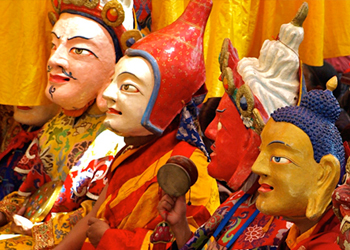 This festival is one of the most interesting attractions in Ladakh. It is believed tht the visitors who witness the festival, bestow merit upon themselves in the teachings and get protection from the evil things. Tsechu is also treated as a social gathering where the local people adorn themselves in the best of clothes and jewelry.